The Next Family caught up with Gabriel Blau who is the Executive Director at Family Equality Council, a national organization advocating for and connecting LGBTQ families. He is married and has a son. I was able to chat with him about life as a dad, how he met his husband, and his job at Family Equality Council. TNF: Tell me about your family. Gabriel: My husband and I have been together for over ten years. We had a big wedding with our family and friends in 2006 and then we were legally married in New York in 2011. We were one of the first gay couples to legally marry in New York City. In 2008 we were able to welcome a child into our family; our son is now 5 years old. We adopted domestically –a private adoption in the United States. TNF: Did you have any challenges? Gabriel: The greatest challenge was getting the information we needed to make the decision and to understand the process. But we were lucky to not face any serious challenges. 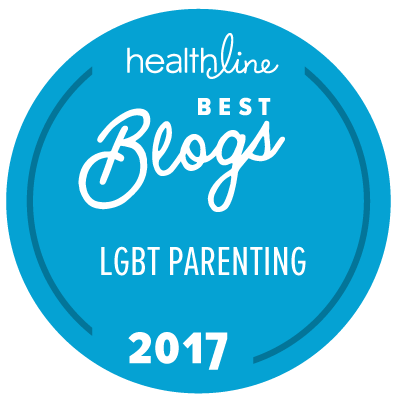 We were fortunate enough to work with the right people -both at home and where our son was born- people who had experience working with an LGBT couple. TNF: Was it was a tough decision? Gabriel: It was as difficult and as easy as it is I think for most families. There’s a lot to consider. Certainly there’s access; we couldn’t leave it up to “chance”. We both wanted to have children. It happened a lot faster than we expected so when we began the process, we assumed it would take much longer. We knew a lot of people who had a great deal of difficulty adopting, or it took a long time so we were prepared for that timeline. But it happened a great deal faster than that. And it was the best decision we ever made. TNF: How did you and your husband meet? Gabriel: We met back in 2003 and it was through a series of coincidences that ultimately brought us to be with the same group of friends on the same night at a synagogue in New York. We’ve been together ever since. TNF: Do you feel any different than other families? Gabriel: That’s a complicated question. We’re very lucky to live in a community and in a neighborhood in New York where there is a lot of diversity. We deal with the same issues most families deal with: hectic schedules, school, playdates, balancing work and home life, the stresses of being responsible parents in general. There are times that we’re reminded that we’re “different”, whether it’s by gendered forms that ask for “mother and father”, by comments or questions from teachers or other parents, or by assumptions being made at the doctor’s office. But because we are personally very lucky we are able to see these moments as opportunities to learn and grow and to make our community and family beautiful. We are a fairly visible family, which can create other challenges, but I think that’s less on being LGBT. We’re very conscious of being LGBT. In other parts of the country we really do feel different but we’ve worked to build a community that is supportive where we have a diverse group of friends…I think that community aspect is really important. Most parents that I speak to really appreciate those opportunities no matter where they live. They realize when they are in a situation that they are with other LGBT families they really start to feel different, it’s important for their children to be in those environments and they feel secure…it’s a big part of the work that we do at Family Equality Council. We have over 150 parent groups we work with across the country; we have experiences like Family Week in Provincetown every summer -this past year we had over 1500 participants there. It’s an important part of the work of building community and building support systems. TNF: You referenced schools, teachers, doctors, assumptions being made. Do you feel accepted generally? Gabriel: In New York, generally we do, yes. There are moments when we have to explain things. But you explain and you move forward. That’s an experience that we don’t want everyone to go through, and so we hope by us going through it, we are helping those doctors, providers, teachers, etc. know how to speak to other parents, not just LGBTQ parents but all parents, to not make assumptions about family constellation and family creation. We don’t face it often but it happens. In our work we see LGBTQ people across the country, facing issues in more severe ways – like not being able to be out, like LGBTQ parents not being able to rely on a school to get the protection they need for their kids. It’s a very real issue. It’s something that is as important to correct as the legal issues we have to work on. Going through life always having to explain who you are, to be treated the way our families are being treated. It’s not the American dream, it’s not what we strive for in this country. TNF: Are you seeing a change now that gay marriage is legal in 15 states? Are things getting better? Gabriel: Things have been continually getting better. The movement has been working very hard to make these changes. Throughout the country our families are still facing the same issues they faced last week and the week before. Certainly the national conversation is turning in a direction that is more positive and we’re seeing more legal equality. But, we’re seeing it in marriage -we haven’t seen it in other areas. There are a lot of other areas that we have to deal with. Let’s not forget that, even with the momentum we’ve had, we have equality in 15 states, that leaves us still with 35 states –and that’s just the issue of marriage equality. Our LGBTQ families across the country are still not able to have legal relationships with their own children; they don’t have access to culturally compentent care; 42% of children report being harassed because of their family constellation. The Employment Non-Discrimination Act has not passed yet. It was a great vote in the Senate but it is not yet the law of the land. These are the issues affecting our families everyday. LGBTQ families are more likely to live at or near the poverty line. They are hard working families trying to do well by their children. Second-parent adoption is not even available in certain parts of the country, so, assuming you can even do that, it’s a whole process you have to go through. It costs money, takes time, and, frankly, can feel very demeaning. Every single parenting study comes to the conclusion that stability is a critical factor in successful parenting. How can we expect our families to do the job they are fighting to do if our country can’t provide them with basic stability –that they are not going to lose their jobs, that if they break up, one of the parents won’t lose his or her relationship with their child, that they won’t lose their housing, that their children will be protected in their schools? TNF: If you could pick one goal that is close to your heart while you are at Family Equality, what would that be? Gabriel: I’m going to give you two: the top goal is to achieve social and legal equality for our families throughout the country. And the specific issue that is always at the top of our priority list is family security, the parent/child relationship. There are a lot of components of that but we need to secure it; it’s absolutely critical. So that will always be at the top of our agenda. We are working now in 15 states, and we always hope to increase that. There are limited resources and it takes time. This work is not just about a single bill, it’s about creating a culture that puts family first. Gabriel: It’s meant everything. It’s the greatest thing in the world. Our son is everything to us. He’s what drives our work..I’m the luckiest person alive…I can’t imagine being any happier. For more information on Family Equality initiatives, check out their website and see all of the services that they provide for LGBTQ. Some of the outstanding programs they have include Family Week, Families in the Midwest, Outspoken Generation, and Pearls of Wisdom. Thank you Gabriel for taking the time to speak with us. You have a beautiful family and we wish you much success. The Next Family is Going to Family Equality Council’s 2017 Impact Awards!